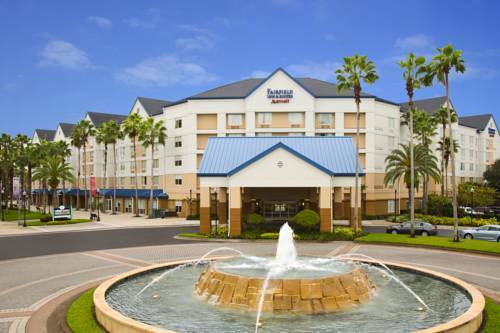 Get a great value at Fairfield Inn & Suites Orlando Lake Buena Vista in the Marriott Village, one of the area's premier Walt Disney World Good Neighbor hotels. Before a day of unforgettable fun, fuel up at our complimentary hot breakfast buffet, then purchase attraction tickets in the lobby and take advantage of our free shuttle service to popular Disney theme parks including EPCOT . Universal Studios, SeaWorld, water parks and shopping at the Orlando Premium Outlets are also within easy reach. Back at our Lake Buena Vista hotel, The Village Market Place serves pizza, deli sandwiches and ice cream treats for lunch and dinner. During downtime, get in a workout in the on-site fitness center with state-of-the-art equipment, or stop by the swimming pool, complete with a children's splash zone. At the Fairfield Inn & Suites, you're our #1 priority. We promise you'll be satisfied, or we'll make it right. That's our commitment to you. Ask us about the Fairfield 100% guarantee. Grab a slice of pizza at Pizza Hut Express and enjoy delicious dining on your EPCOT vacation. Edy's Grand Ice Cream is the perfect choice for a delicious dessert option while in Florida.